Hello everyone, and welcome to the Student-Tutor Podcast! Is YouTube really a medium that can take someone from making videos in their home to traveling across the world? What does it take to turn a curiosity or passion into a full time fulfilling lifestyle? Is it Luck? Or, is it a combination of action and strategy? 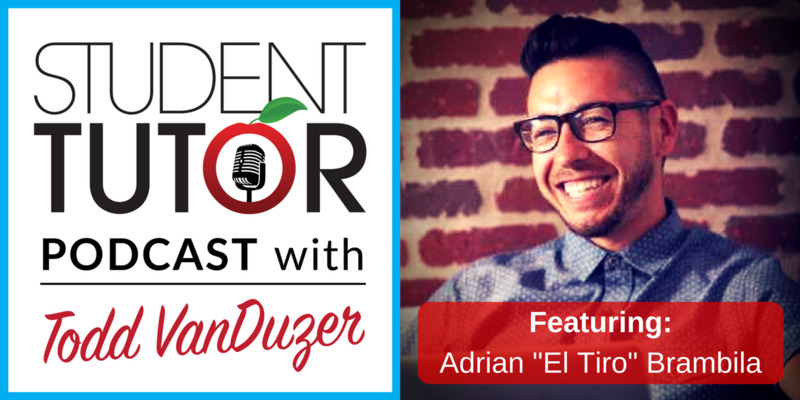 This week, we’re joined by Adrian Brambila, aka “El Tiro,” a self-taught dancer and YouTube sensation from Fallbrook, California. Currently, his channel has over 10 million views and over 75,000 subscribers. Adrian has toured for the artist T-Pain and performed in line ups with Bruno Mars, Ludacris, B.O.B, and has even done private shows for artists like Akon. With his old dance crew called “The Body Poets” out of San Diego he came out on Season’s 7 America’s Got Talent making it the Las Vegas Round. Adrian has since founded his own dance clothing company called Dance Saves Lives which donates its profits to teaching dance in places of poverty all around the world. When Adrian is not dancing he is a co-owner of Unimarketa, a digital marketing firm. Adrian has traveled and inspired countless of people across the globe through his YouTube tutorials and Dance Saves Lives workshops which consist of motivational speaking about living positive, building self-confidence, and of course teaching dance. [7:30] – Gaining traction, how one mom made it happen. 1. LOVE what you do. It all starts with WHY. Money, followers, and long-term satisfaction will come as a result of doing what you LOVE. Give yourself time to grow your craft, and release the need for instant results. 2. Focus on building TRUE fans and relationships. Don’t worry about making it to 100,000 viewers as fast as you can! Instead, focus on building REAL relationships with the people closest to you, that support you unconditionally… don’t be afraid to ask mom for help! 3. Unique Content + Digital Marketing = Great Success! Learn how to market the things you’re creating and leverage internet resources! Whether it’s a product that you’re creating, products relating to your content, or even random trand items… there’s tons of opportunities to make money online, even as a teenager!